AVR Basic Development BoardA general purpose 40 pin AVR Basic Development Board with on board power supply circuit, RS232 port for serial interface with computer and other serial devices, reset switch, power status LED, a 6 pin ISP header and a general purpose LED and Switch. 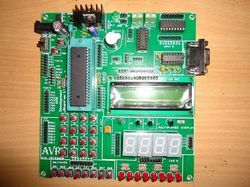 There are various types of this board... AVR Development Board-Big, AVR Basic Development Board and AVR Intermediate board. A general purpose 40 pin AVR Basic Development Board with on board power supply circuit, RS232 port for serial interface with computer and other serial devices, reset switch, power status LED, a 6 pin ISP header and a general purpose LED and Switch. The board is compatible with the Atmega16, Atmega32 and other compatible 40 pin AVR microcontrollers. This board is perfect if you are just starting out with AVR programming.A general purpose 40 pin AVR development board with on board power supply circuit, RS232 port for serial interface with computer and other serial devices, reset switch, power status LED, a 6 pin ISP header and a general purpose LED and Switch. 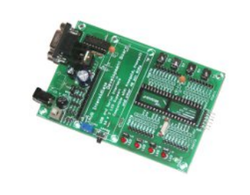 The board is compatible with the Atmega16, Atmega32 and other compatible 40 pin AVR microcontrollers. 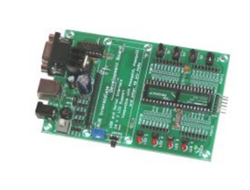 This board is perfect if you are just starting out with AVR programming. A general purpose AVR Intermediate Development Board with 16x2 LCD support, power supply circuit, RS232 port for serial interface with computer and other serial devices, reset switch, power status LED, a 6 pin ISP header and 4 x general purpose LEDs and Switches. The board provides port extensions for all ports and also provides an empty hole for each IO pin, where wires and connectors can be soldered directly for further expansion. 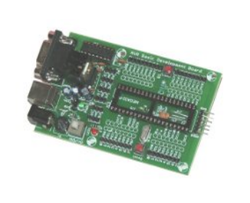 The board is compatible with the Atmega16, Atmega32 and other compatible 40 pin AVR microcontrollers. Use this board to kick start development based on compatible 8051 microcontrollers. The board lets you concentrate on programming, testing and optimizing your code, and thereby your overal project, rather than spending time in getting to know the electronics required to use these microcontrollers. These boards are perfect for learning, testing and development. The Intermediate Board offers support for 16x2 LCDs with onboard contrast control and it offers a lot more general purpose LEDs and Switches than our basic boards (4 x general purpose LEDs and Switches). The LEDs and Switches are connected to the IO pins on the microcontroller through jumpers and their connection to the pins can be disabled if you wish to use the IO pin for other purposes. A general purpose AVR Intermediate Development Board with onboard USB support, 16x2 LCD support, power supply circuit, RS232 port for serial interface with computer and other serial devices, reset switch, power status LED, a 6 pin ISP header and 4 x general purpose LEDs and Switches. The board provides port extensions for all ports and also provides an empty hole for each IO pin, where wires and connectors can be soldered directly for further expansion. The board features an onboard USB to Serial converter which can be used to do serial communication between the microcontroller and the computer over the USB port. This greatly increases the easy with which the board can connect and communicate with computers. The board is compatible with the Atmega16, Atmega32 and other compatible 40 pin AVR microcontrollers. Use this board to kick start development based on compatible 8051 microcontrollers. The board lets you concentrate on programming, testing and optimizing your code, and thereby your overal project, rather than spending time in getting to know the electronics required to use these microcontrollers. These boards are perfect for learning, testing and development. The Intermediate Board offers support for 16x2 LCDs with onboard contrast control and it offers a lot more general purpose LEDs and Switches than our basic boards (4 x general purpose LEDs and Switches). The LEDs and Switches are connected to the IO pins on the microcontroller through jumpers and their connection to the pins can be disabled if you wish to use the IO pin for other purposes.